Lift Safe offers a range I.P 66 rated lifters with mechanical and powered attachments designed to meet the customer’s requirements. LSH90IP66 is designed for demanding environments such as those found in the pharma and food industries, where production equipment is subject to strict hygiene and cleaning requirements (IP66). The stainless steel INOX 90 lifts, moves and handles loads weighing up to 90 kg. The lifter is electropolished and equipped with a remote control with two speeds. The lifter features built-in overload protection, safety clutch and battery indicator, and all movable parts are shielded. All tools for the INOX 90 are made of stainless steel. LSH200IP66 is designed for demanding environments such as those found in the pharma and food industries, where production equipment is subject to strict hygiene and cleaning requirements (IP66). 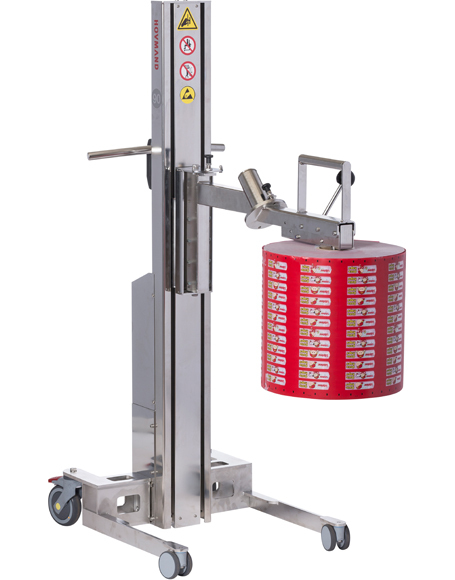 The stainless steel INOX 90 lifts, moves and handles loads weighing up to 2000 kg. The lifter is electropolished and equipped with a remote control with two speeds. The lifter features built-in overload protection, safety clutch and battery indicator, and all movable parts are shielded. The LSU 200MS is perfect for clean rooms and working environments where temperatures are low and humidity is very high. With its fully open chassis, it has been designed to be fully cleaned each day without affecting its performance, avoiding all types of oxidations thanks to the stainless materials, plastics, and polymers used in its design and build. 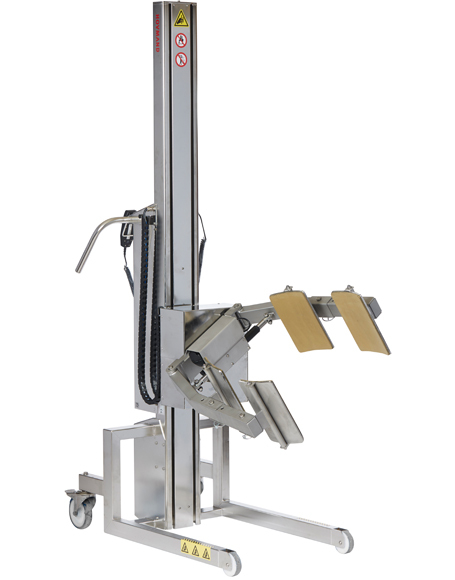 The LSU EXT 100 electric scissor high-lifter offers an innovative design to improve the ergonomics in the handle of dairy products (cheese, milk, yogurt…) and the load keeps always to the suitable height to collect/deposit them and reducing the effort. The ergonomic tiller arm allows the operator a easy handling of the equipment, reducing the effort in the goods lifting and transport. Remote control (optional) allows the lifting and lowering of the forks without moving on to the controls of the tiller. 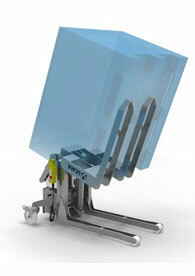 The LSUEBT10 tilters allow an ergonomic handling/casting of loads, thanks to the tilting system of 85º and 105º. These models have an innovative design that makes possible an ergonomic handling/tilting to a conveyor belt or other containers of products of meat industry reducing efforts. Manufactured 100% in stainless steel including all hydraulic equipment. The LSUEBT10s tilters allow an ergonomic handling/casting of loads, thanks to the tilting system of 85º and 105º. 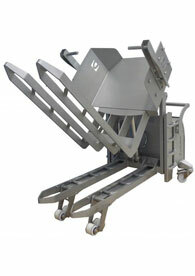 These models have an innovative design that makes possible an ergonomic handling/tilting to a conveyor belt or other containers of products of meat industry reducing efforts. 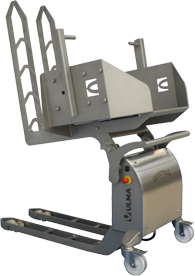 The LSUEBT750 inox truck tilter allows an ergonomic handling/casting of loads, thanks to the tilting system 90º. This equipment has a hygienic and ergonomic design that makes daily cleaning a dream, avoiding the microbiological contamination risk and ergonomic load handling of the products inside the bins to a conveyor belt or other containers, reducing the effort.